Environmental monitoring systems prevent hardware damage to server rooms, data centers and network closets with critical condition alerts and remote reboot capability. Also known as: remote environment monitoring system, monitor server rooms, data center monitoring, computer room, network closet, temperature sensor, remote power reboot, web alert thermometers, server room monitoring. Environmental threats in your server room can cause a lot more damage than hardware or software problems. Redundant hardware, backup tapes, UPS battery arrays, generators and other fault-tolerance measures can all be rendered useless if your server room overheats or floods. 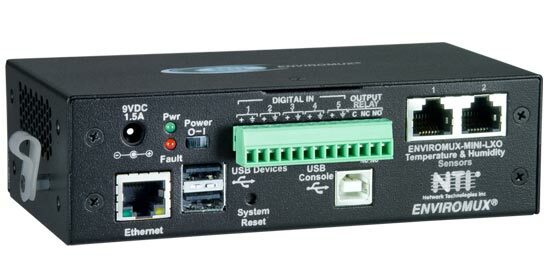 Don’t ignore environmental threats – remotely manage them with an ENVIROMUX® Server Environment Monitoring System or Intelligent Power Distribution Control Unit via TCP/IP Ethernet protocol over CAT5 through an RJ45 connector. Monitor Temperature The most common environmental threat in any server room or wiring closet is heat. Detect critical rises or drops in temperature, and receive notifications when heating problems occur. Monitor Humidity Detect abnormal humidity conditions. You define the humidity levels that are appropriate for each sensor’s environment. Detect the Presence of Water Whether it’s a tripped sprinkler system or a flash flood, a server room or wiring closet is just about the last place you want to see water. Receive notification as soon as water makes an appearance. Monitor Physical Security Monitor “dry-contact” devices including motion sensors, door sensors, vibration sensors and smoke detectors. Control Power Remotely reboot and control power (on/off) to servers and network devices. Optional 48V DC-DC power converter built inside the unit. The ENVIROMUX® Mini Environment Monitoring System monitors critical environmental conditions (such as temperature, humidity, and water leakage) that could destroy network components in your server room. When a sensor goes out of range of a configurable threshold, the system will notify you via email, SNMP traps, web-page alerts, a visual indicator (red LED), voice phone calls (via Automatic Voice Dialer System), and SMS messages (via USB 3G modem). The ENVIROMUX® Secure Remote Power Control Unit allows you to remotely reboot and control power (on/off) to up to eight servers or other powered devices from any location via secure web interface, RS232, SSH, or Telnet.